Dmitri with a scroll painted by his father, Stephen Carter. Carter Family Marionettes, Circa 1988. 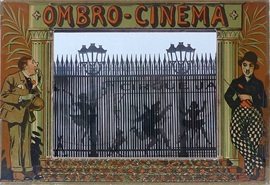 The Ombro Cinema toy was manufactured in France in the early 20th Century by Saussine Ed. By moving a strip of acetate with vertical lines, over the panorama scroll with interlacing images, the action creates the illusion of motion. The box is made from a cardboard type material. The little crank handles are made of bent nails. There are two story scrolls that came with this box. One scroll is the story Puss and Boots. The words of the story are printed at the very bottom of the back of the scroll so that it can be read by the person cranking the box. 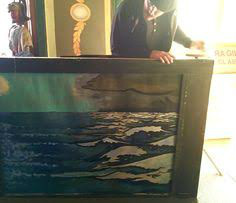 You can hear Dejah Leger interpreting the story (from French to English) as Dmitri moves the scrolls. The other story scroll is called "Tour of the World". Filmed November, 2012. 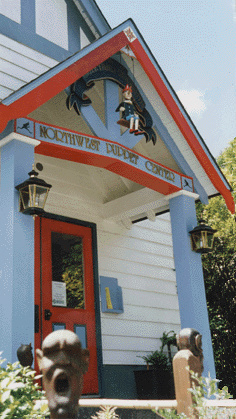 Ombro-Cinema filmed in 2012 at the Northwest Puppet Center.